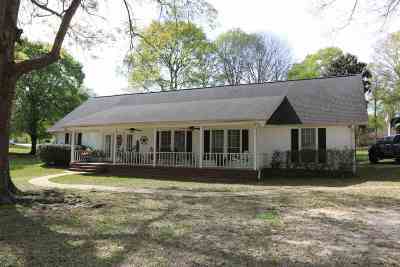 Beautiful custom brick, three bedroom, two bath home across the street from the Holmwood Lake. Access this home with paved streets and a paved driveway, perfect for riding bikes or taking an afternoon walk. This home features granite countertops and a wide open floor plan which makes entertaining super easy. Kitchen appliances such as refrigerator, stove and dishwasher all stay with the home. The living room has a gabled ceiling and French doors leading to the back patio. All bedrooms are secluded with the master being on the West side of the home and guest bedrooms being on the East side. The home offers upgraded wood flooring and carpet in the bedrooms. Enjoy rocking on this huge 40x7 covered front porch or you can cook burgers on the back patio. Enjoy two beautifully landscaped lots with a chain-link fenced back yard for your precious babies and a 40x24 RV cover for your adult toys!